One thing to keep in mind — Lauer has a tremendous pickoff move. He has picked off four in four consecutive games. That quickly, Bader was erased. Eric Lauer has picked off a runner five games in a row. This is just the fifth time that’s known to have happened in major-league history, and this active streak is a Padres franchise record. The major-league leader in pickoffs in 2016 had six. The major-league leader in pickoffs in 2017 had seven. Lauer already has seven in 2018. He’s two ahead of anyone else, even though he’s thrown just 45 innings. Sure, if you wanted to be critical, you could say that Lauer has given himself plenty of pickoff opportunities. But he’s been a baserunner-erasing machine. When Lauer is on the mound, every runner has to be careful. Being a lefty, Lauer has an obvious advantage. Whenever there’s a runner on first, Lauer can choose to look right at him. Yet every runner also knows that. Every runner takes that into consideration. Runners know they have to be more cautious when a lefty is pitching, but that caution hasn’t come to their collective aid. And I should say there’s some precedent for this — last year, over a dozen starts in High-A, Lauer had four pickoffs. And then, over ten starts in Double-A, Lauer had six pickoffs. His pickoff move is so quick that it was responsible for sending teammate Josh Naylor to the disabled list after the first baseman was hit in the face by a throw. Even Naylor was caught by surprise. And while there’s always some risk for the pitcher, Lauer hasn’t been called for a single balk since he was pitching for Kent State in 2015. Mark Buehrle finished his career with an even 100 pickoffs, but he was charged with 16 balks. Andy Pettitte finished his career with 98 pickoffs, but he was charged with 11 balks. At least to this point, Lauer has managed to stay on the permissible side of the line. His motion is clean, and his motion is effective. There’s no avoiding it: The rest of this post is going to be riddled with videos. 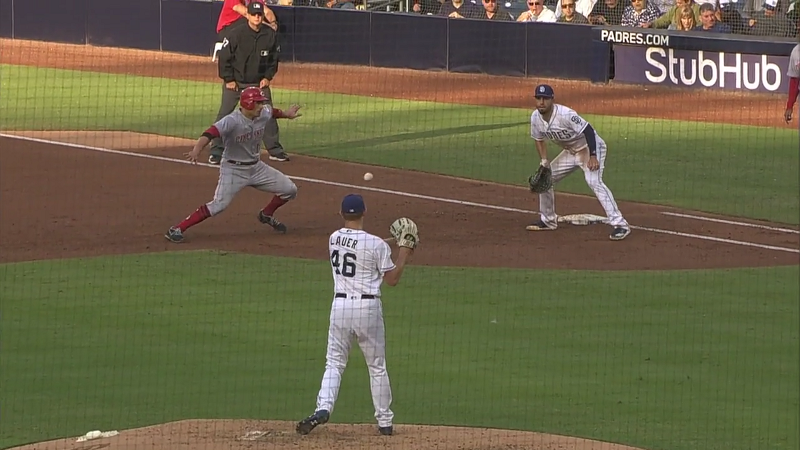 It’s one thing to talk about pickoffs, but it’s quite another to see them in action. What makes Lauer’s move so good? We can go in order, beginning with the pitch immediately prior to his first big-league pickoff. It’s not the move itself that’s particularly deceptive. Everything looks the same up through the leg lift, but that’s normal. You can spot the difference in those clips pretty quickly. What’s important is the speed. In the pickoff, you see how quickly Lauer gets his foot down. You see how he flips the ball over from the side, instead of throwing overhand. It’s a much shorter throwing motion, and the throw, of course, is also accurate. Andrew McCutchen wasn’t fooled. Andrew McCutchen was beat. There’s a difference. Lauer can just be quicker to the bag than many runners. You’ve heard that a pitcher is supposed to step directly to the base he’s throwing to. 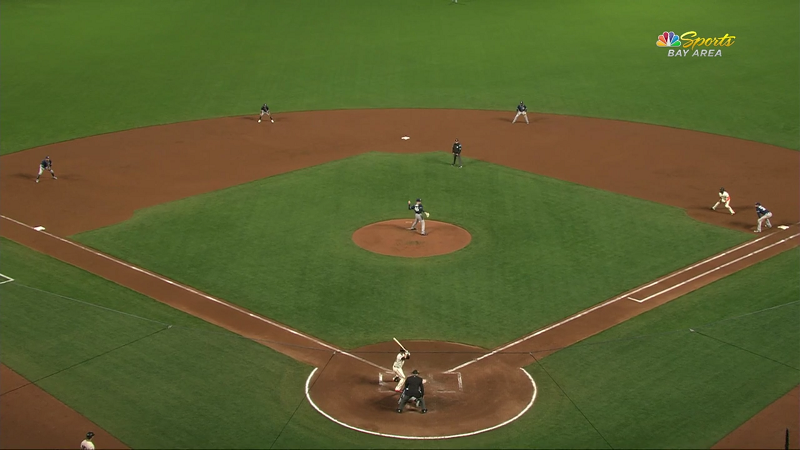 The way that’s interpreted, umpires imagine a 45-degree line from the rubber, pointing between home and first. From this angle, I can’t tell you exactly where that 45-degree line would point. I think it’s pretty apparent that Lauer is at close to 45 degrees. In his motion, he also comes close to swinging his right foot behind the back plane of the rubber. That would be a no-no, as well. Lauer comes close to committing a balk. But he hasn’t been called for a balk in years. The umpires haven’t seen anything wrong, even if Lauer is coming right up to the edge. If he can do that consistently, it’s only going to keep working in his favor. It was reviewed. Lauer won. And what gets me is that Brian Anderson wasn’t even fooled. He had a small lead! Anderson was barely off first, and he wasn’t looking to run, and Lauer nabbed him anyway. I should make sure to give some credit in here to Eric Hosmer, who’s been doing a great job of catching these throws and applying quick tags. It’s like we’ve always said, Hosmer is a premium defender at first base. That’s exactly right. For the most part, this isn’t a matter of deception. Lauer has simply perfected his snap throw, which is what’s allowed him to rack up those five pickoffs where the runner wasn’t running on first move. This year, in the majors, 42% of pickoffs have been pickoffs and caught steals. Lauer has five regular pickoffs, and the next-highest total is three. Lauer is just quicker to first base than the runners leading off of it. That’s a lesson for the runners to learn. On the one hand, you could say, welp, runners will adjust, and the pickoffs will disappear. They’ll just take slightly smaller leads. On the other hand, Buehrle and Pettitte never stopped picking guys off, long after their reputations were established. And if runners did just shrink their leads, and take fewer chances, that would still be a benefit, because it would limit their ability to move more quickly around the bases. What the National League should be aware of, now, is that Eric Lauer has a killer pickoff move. We’ll see if he can extend a pickoff run that’s already historic. We hoped you liked reading Eric Lauer Has Seven Pickoffs by Jeff Sullivan! Many of those Buehrle balks were called by Joe West. I would guess all 16 of them. Buehrle proved that if you do all the little things well – he’s was an exceptional fielder, great at keeping runners in check, worked fast and didn’t walk anyone – that you can be successful with well below average raw stuff.